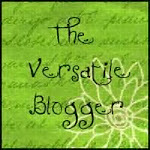 Yes, i have been nominated by Christine for The Versatile Blogger Award. I am so excited to receive this award from a blogger who writes lovely poems and blogs on various subjects. Thank you Christine! :-) Words would fail to express my gratitude! Christine and I competed for "Picture worth the words contest" together and i truly admire her work. 1. Add a picture of the award in your post. 2. Thank the award giver. 3. Share 7 random facts about you. 4. Choose 15 other bloggers to pass the award to and let them know that they’ve been nominated. 1. I have a poor sense of humor. 2. I believe in the macro-micro cosmos. I believe every life on Earth has a power derived from the Universal powers lying dormant within. 4. I love to read about anything under the sun from Science to History. 5. I am fascinated by ancient wisdom. 6. Oops, ran out of facts! I love intellectual talks; the idea of sitting with a dear friend and talking for hours over a cup of coffee excites me. 7. I love the Ocean, can spend countless hours staring at her. I enjoy reading your blogs; the thought trails; poems; stories; musings; social messages; and more - The award is my way of appreciating, acknowledging and thanking your work. Hey can you please let meknow what hurdle you face commenting in blogger? Congratulations Rahul ...yipee this is my first ever blog award!!! thank you Divya .. thanks a ton for this award ! I haven't faced in any problem in commenting. But, i have noticed wordpress users aren't able to comment on blogger seamlessly! I am still searching for a solution. How did you guess?? is it so obvious? :-) Of course, you deserve it! Congrats! I just saw your comment there. Thanks! Congrats! Ocean is so beautiful! Congrats! Looking forward to more of your writing. Congratulations....looking at the variety of subjects you have covered, you deserve this. Thanks for nominating me. It is an honour. Versatile...me! I can't believe this. I am not able to add the picture in my blog. I get a 'gadget error' can you please help? Are you able to save the image? I can send the image to your mail. Congrats and thanks for the nomination! Seventh fact - just curious on what made you attribute the feminine gender to the ocean. Thanks Divya, but I have moved to http://indianhomemaker.wordpress.com/ I only use my blogspot blog id for commenting on blogs where commenting from wordpress id is difficult. congrats on the award .. came over from rahul's blog..
humour :- well humour is humour poor or rich what does it matter .. I shall drop by your blog soon! Thanks! I have been following your blog for a while now and like reading yours. Oh ok! wasn't aware of it. I shall keep that on mind. interesting! I love ocean too and the sound the waves make but it looks really scary at night. Ankita - Nice to know we share a few interests!